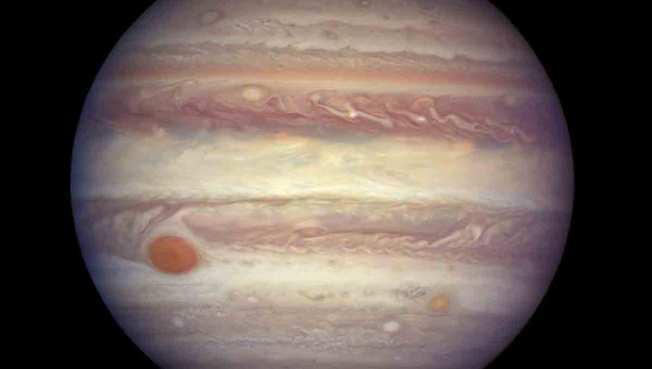 Scientists were looking for objects on the fringes of the solar system last year when they pointed their telescopes close to Jupiter's backyard, according to Scott Sheppard of the Carnegie Institute for Science in Washington. They saw a new group of objects moving around the giant gas planet but didn't know whether they were moons or asteroids passing near Jupiter. "There was no eureka moment," said Sheppard, who led the team of astronomers. "It took a year to figure out what these objects were." The moons had not been spotted before because they are tiny. They are about one to two kilometers (miles) across, said astronomer Gareth Williams of the International Astronomical Union's Minor Planet Center. "We just haven't observed them enough," said Williams, who helped confirm the moons' orbits. The team is calling one of the new moons an 'oddball' because of its unusual orbit. Sheppard's girlfriend came up with a name for it: Valetudo, the great-granddaughter of the Roman god Jupiter. Valetudo is in Jupiter's distant, outer swarm of moons that circles in the opposite direction of the planet's rotation. Yet it's orbiting in the same direction as the planet, against the swarm's traffic. "This moon is going down the highway the wrong way," Sheppard said. "What astonishes me about these moons is that they're the remnants of what the planet formed from," he said. Galileo detected Jupiter's four largest moons, Io, Europa, Ganymede and Callisto in 1610. The latest count of 79 known planets includes eight that have not been seen for several years. Saturn is next with 61, followed by Uranus with 27 and Neptune with 14. Mars has two, Earth has one and Mercury and Venus have none.